Photoshop Recovery tool is the best way to repair PSD, PSB, & PDD files. Changes: Since it's a new release, no changes have been done so far. 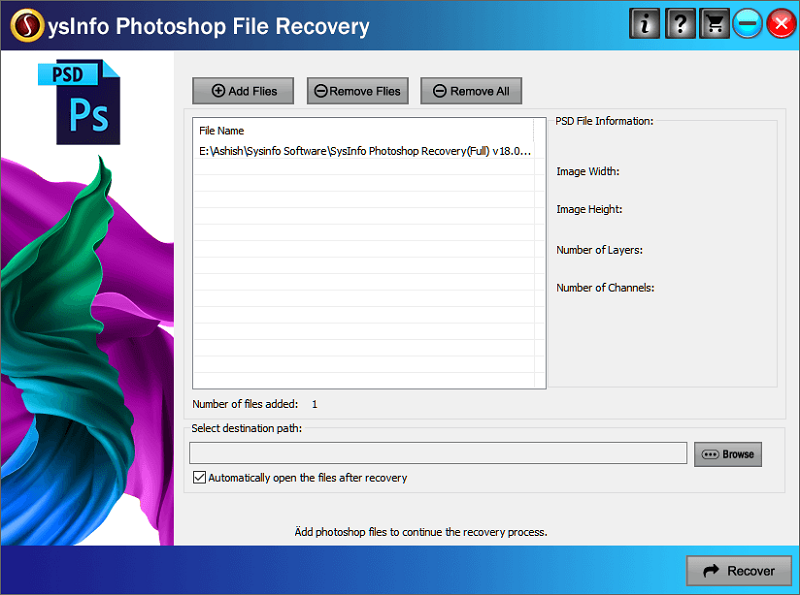 Press release: The Photoshop Recovery tool can repair Photoshope files like PSD, PSB, & PDD. SysInfoTools Photoshop Recovery tool is one of the best solutions to repair and recover Photoshop file created by all popular versions of Adobe Photoshop. The triial version of SysInfo Photoshop Recovery software can be freely distributed over the Internet in an unchanged form. SysInfoTools Photoshop Recovery Copyright by SysInfoTools Data Recovery. Your Agreement to this License You should carefully read the following terms and conditions before using, installing or distributing this software, unless you have a different license agreement signed by SysInfoTools Data Recovery.